ICB increases tumor vessel perfusion in treatment-sensitive, but not treatment-resistant, breast tumor models. Mice bearing orthotopic breast tumors (MMTV-PyVT, EO771, 4T1, or MCaP0008) were treated with an anti–CTLA4 antibody or an isotype-matched control antibody (MPC11) every 3 days for a total of 4 doses; tumor size was measured every 3 days. Vessel perfusion of tumor tissues was assessed by confocal microscopy. (A) Anti–CTLA4 therapy inhibited tumor growth and increased vessel perfusion in EO771 breast tumors. Scale bars: 100 μM. (B) Anti–CTLA4 therapy reduced tumor tissue hypoxia in EO771 breast tumors. Scale bars: 1,000 or 100 μM. 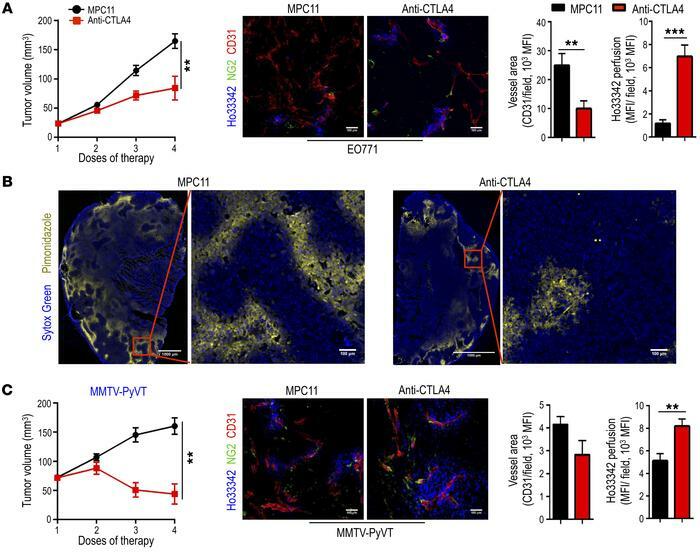 (C) Anti–CTLA4 therapy induced tumor regression and improved vessel perfusion in MMTV-PyVT breast tumors. Scale bars: 100 μM. MFI, mean fluorescence intensity; Ho33342 (blue), Hoechst 33342 perfused area; CD31 (red), endothelial cells; NG2 (green), pericytes; and Sytox Green (green), counterstained for tumor tissue. Significance was determined by unpaired 2-tailed Student’s t tests. Data are from 1 experiment representative of 3 independent experiments with similar results (n = 8–10 mice per group in A and B; n = 7–8 mice per group in C). All data are mean ± SEM. **P < 0.01, ***P < 0.001.